Mr. Russ Leighton is dedicated to aviation safety and has devoted his career to the pursuit of safety education and knowledge. His work has proven to benefit all of aviation. Russ is focused, committed, and often times will selflessly sacrifice personal time in order to complete tasks and responsibilities related to safety work; he is a true pillar of aviation. His influence has extended into numerous airline flight departments through his leadership on several industry Boards. He currently serves as the Director of Safety for the Coalition of Airline Pilots Associations (CAPA) and also serves as the Aviation Safety Coordinator for the International Brotherhood of Teamsters Airline Division. Russ is responsible for training and maintaining Aircraft Accident Go-Teams, which help the NTSB as parties to investigations. Previously, he worked as an Air Safety Investigator for the NTSB, serving as Investigator-In-Charge on over 50 aircraft accidents. He serves on FAA Aviation Rulemaking Committees (ARC) on behalf of CAPA, the FAA’s Commercial Aviation Safety Team (CAST), and Aviation Safety and Information Sharing Executive Board (ASIAS). Previously, he served on the Flight/Duty time ARC which defined new regulations for pilot flight time and duty time limits. The new regulations use fatigue science as a basis for the first time ever and were last updated 50 years ago. Russ also served as Committee Chair for the FAA’s Pilot Records Database ARC which will be used to develop FAA regulations to create and maintain a comprehensive database of pilot training and qualifications for air carrier hiring usage. Russ has been a pilot for over 25 years with more than 14,000 hours flight time. His current job is flying internationally in a Boeing 767. Russ graduated from Embry-Riddle Aeronautical University in Prescott , AZ with a B.S. in Aeronautical Science and a Minor in Aviation Safety and currently resides in St. David, Maine. 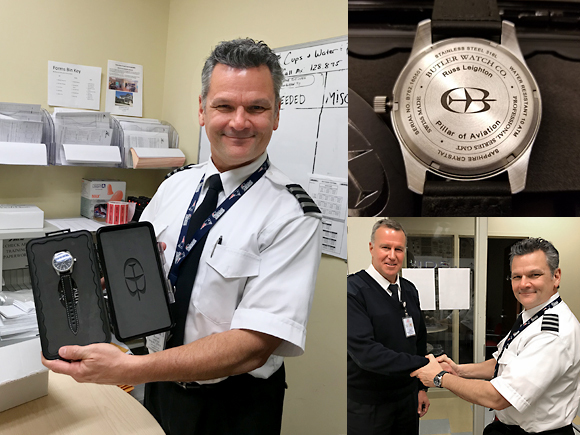 Butler Watch Company Salutes Dedicated Individuals in Aviation. Butler Watch Company periodically acknowledges outstanding and committed individuals with our own brand of salute; "Pillar of Aviation." In the aviation industry, a great number of people provide behind the scene effort to implement, and uphold the myriad of requirements necessary for safe and efficient operations. Their job titles include mechanic, dispatcher, administrator, fueler, aircraft support and customer service personnel, air traffic controller, engineer, etc. At Butler Watch Company, we value the inspiration found in people throughout the world who dedicate themselves to making a positive contribution in aviation. Good people are the essential support that aviation depends on to exist as a safe and efficient endeavor, for everyone to enjoy. Certain individuals are especially influential because of their devotion to their position. They exude passion about meeting and exceeding the standards required of them. This person will go beyond the description of their job duty, making creative solutions where necessary and donating personal time to their commitment. As a result, they impact their environment in a positive manner and are inspirational through both action and personality. These people are Pillars of Aviation. Help Butler Watch Company salute other outstanding individuals. Butler Watch Company will acknowledge a new "Pillar of Aviation" recipient periodically. Aviation enthusiasts are welcome to join the process of selecting other individuals for our "Pillar of Aviation" salute. Please register for our e-newsletter to receive more information about nominating an outstanding individual in your aviation comunnity. "a pillar of the aviation community." Mr. Pfeifer is a volunteer at the San Mateo County Sheriff's Air Squadron where he is an inspirational influence to personnel and a keystone to the organization's operations. Mr. Pfeifer is dedicated to his work and the Air Squadron values his service and commitment. 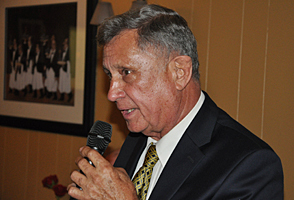 Mr. Pfeifer is known for his natural ability to instruct and inspire people due to his own passion, drive, and his many decades of aviation experience. Starting in his youth, he worked with his mother and father who mentored him in aviation. He served in the US Army as a helicopter pilot and taught many of his fellow soldiers how to fly in the army flying club he helped found. Mr. Pfeifer started his professional flying career at United Airlines as a DC-6 flight engineer. Next, he ushered in the Jet age while flying the Boeing 727 and DC-10. He finished his airline career as a captain on the Boeing 747-400. Mr. Pfeifer has flown a long list of aircraft, including those dating back to WWI. In addition, he's built, fabricated, and restored aircraft, and assisted others on their projects. Rex has made a career out of helping build and run a cargo airline flight department. He has done so while employing both common sense and competency. 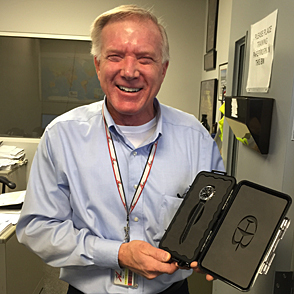 For more than 35 years, Rex has worked in various aviation positions. His current work includes developing flight department policies and procedures, working with the FAA, and ensuring company training records compliance, among other things. Rex approaches his work activities with a positive demeanor and employs an inspirational personality. He is a valuable resource for information and a leading provider of solutions to the flight department. Rex works diligently by day, and when necessary, he is on the flight line at night, ensuring that aircraft operate in compliance with policies and procedures. He certainly deserves commendation for supporting Aviation through his efforts.